Here’s the latest reports from fishing guides in the area. Matt Schenk from CO had fast action catching and releasing trout and Spanish mackerel on Clouser flies. Anglers fishing with me, out of CB’s Saltwater Outfitters on Siesta Key, had good action on several trips recently in Sarasota Bay catching and releasing trout to 20”, Spanish mackerel and blues on flies and CAL jigs with jerk worms. We fished deep grass flats with clear intermediate sink tip fly lines and jigs on spinning tackle. Dylan Lewis and Matt Schenk, both from CO, had great action catching and releasing trout and Spanish mackerel on Clouser flies on a trip with me in Sarasota Bay on Tuesday. Steve and Doug Sutter, from Sarasota, also had good action with trout, Spanish mackerel and bluefish on Clouser flies and CAL jigs with jerk worms while fishing Sarasota Bay with me on Friday. Capt. Kevin Wessel and I were the instructors for an IWFA (International Women’s Fishing Association) fly casting clinic on Saturday. Sponsors included CB’s Saltwater Outfitters, Orvis, Simms and Denise Freihofer. 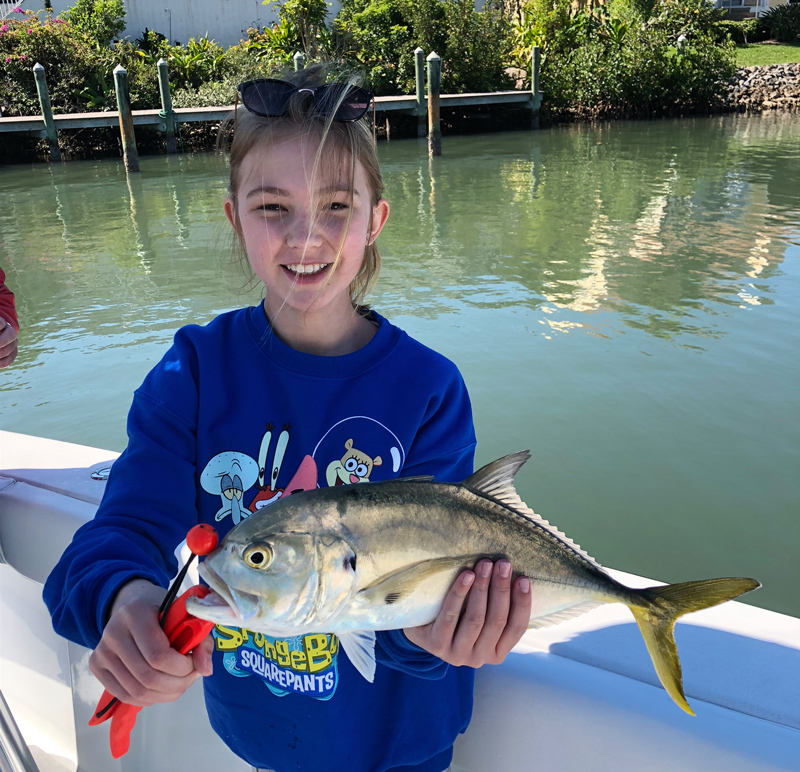 Students received fly casting instruction and sharpened their fly casting skills before hitting the water in Boca Grande for a “funament” next week. There should be good action with trout, blues, Spanish mackerel, pompano and more on deep grass flats of Sarasota Bay. Fishing shallow water for big trout, snook and reds with lures and flies is challenging although they should also be a good option now. Fishing dock lights in the ICW at night is always a good option for snook and more. Our natural resources are under constant pressure, please limit your kill, don’t kill your limit! Anglers fishing with me, out of CB’s Saltwater Outfitters on Siesta Key, had good action in the Terra Ceia area catching and releasing several snook, reds and trout on CAL jigs with shad tails during the past week. We also had some action on a couple of trips in Sarasota Bay catching and releasing trout on CAL jigs with shad tails and jerk worms, DOA Deadly Combos and flies. Mike Perez, from Sarasota, and his 9-year old granddaughter, Harper Perez, from IN, fished Sarasota Bay with me on Tuesday. She did well casting CAL jigs with shad tails and jerk worms and DOA Deadly Combos, catching and releasing several nice trout. Dave Reinhart, from, MA, and Domenick Raschella, from VA, fished the Terra Ceia area with me on Wednesday. Fishing shallow water with lures and flies usually isn’t easy but they fished hard and caught and released several snook, a couple of reds including an 8-pounder and trout on CAL jigs with shad tails. Fly angler Mark Nielson, from Seaford, DE, fished Sarasota Bay with me on a very windy day on Thursday. Despite a stiff 15 to 20-mph wind, he hung in there and caught and released a nice trout on a Clouser fly. It’s not often that I have a client from Delaware, much less my hometown, where Mark and I were high school classmates. Fishing shallow water for big trout, snook and reds is usually challenging although they should be a good option now. There should also be good action with trout, blues, Spanish mackerel, pompano and more on deep grass flats of Sarasota Bay. Fishing dock lights in the ICW at night is always a good option for snook and more. Our natural resources are under constant pressure, please limit your kill, don’t kill your limit! Twelve year old Skylar Henry of Lincoln, Nebraska with one of several large jack cravalle she caught this week. The water temperature has been up and down this month and the fishing has been steady throughout the changes. Anglers this week have enjoyed a variety of action from large jack crevalle on top water to black drum on shrimp around docks. The flats are producing ladyfish, speckled trout and Spanish mackerel. A few redfish and snook were also caught this week mostly on live shrimp. Top angler of the week goes to Skyler Henry of Lincoln, Nebraska who fought off the cold temperature to catch a several large jack cravelle. She fought a number of jacks until she warmed up! Mangrove snapper and a Sarasota Bay billfish (needlefish) were also caught this week. Remember, the best time to go fishing is when you can and be sure to save some for seed! Anglers fishing with me, out of CB’s Saltwater Outfitters on Siesta Key, had some action catching and releasing trout in Sarasota Bay, snook at night in the ICW and trout and redfish in Gasparilla Sound near Boca Grande on flies and CAL jigs with shad tails during the past week. The best action was catching and releasing snook on flies in the ICW at night. Monday’s trip was cancelled due to wind and cool temperatures as a front moved through that day. 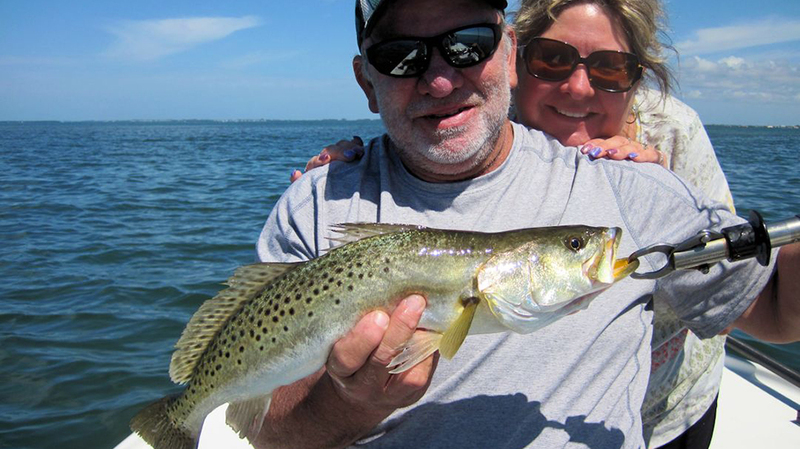 Anna Maria Island winter resident Tony Merlis and his daughter, Jen Merlis, from MN, fished Sarasota Bay with me on Tuesday and had some action catching releasing trout on flies and CAL jigs with shad tails. Martin Marlowe, from NY, and his son Bruce Marlowe, from SC, fished the ICW me on Wednesday night. It was Martin’s last trip with me before heading back north for the year and they finished strong. Despite cool water and a cold north wind, they had good action catching releasing numerous snook on my Grassett Snook Minnow fly. Lynn Skipper, from Apollo Beach, FL, fished the backcountry of Gasparilla Sound near Boca Grande with me on Thursday and Keith McClintock, from Lake Forest, IL and Stephen Liska, from Naples, fished the same area on Friday. With water temperatures in shallow water in the low 60’s to start, fishing was challenging. We caught and released a few trout and a red on CAL jigs with shad tails. The fishing world lost a gem when fly fishing legend, Lefty Kreh, passed away a few days ago. He was an author, photographer, outdoor writer and fly casting guru. A world class fly angler and casting instructor, he traveled the world pursuing fly fishing and sharing his knowledge. As rich as he was with knowledge, a conversation with him was like chatting with a family member or neighbor. I was fortunate to have had him as a guest on my boat twice. His wit and down home personality endeared him to many. He will be missed! 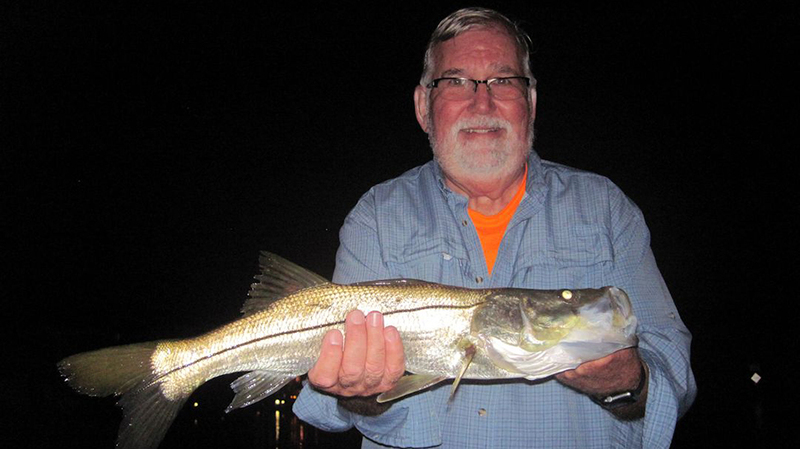 Caption-Rich Hunter, from Longboat Key, with a snook caught and released on a fly while fishing the ICW at night with Capt. Rick Grassett. Anglers fishing with me, out of CB’s Saltwater Outfitters on Siesta Key, had good action catching and releasing snook in the ICW at night and trout in Sarasota Bay on flies and trout, redfish and snook on CAL jigs with shad tails in Gasparilla Sound near Boca Grande during the past week. The best action was with snook at night. Jerry Poslusny, from Palmetto and Rich Hunter, from Longboat Key, fished the ICW with me on Wednesday night. They had good action catching and releasing numerous snook and a nice trout on my Grassett Snook Minnow fly. Snook season reopened on March 1st on the west coast, although personally I will continue to ask clients to release them. Snook are a fantastic gamefish and too valuable of a resource to only catch them once, in my opinion. 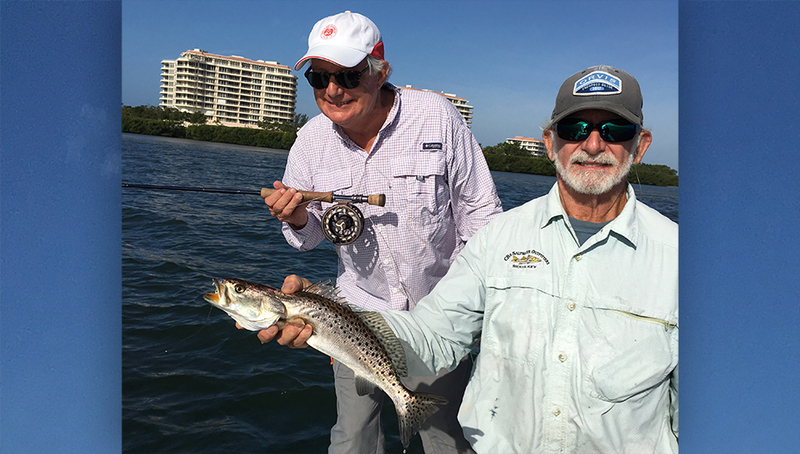 Tom Sachs, from Longboat Key and Jeff Holsworth, from MI, fished an instructional fly fishing trip in Sarasota Bay and had some action catching and releasing trout on deep grass flats on Ultra Hair Clouser flies with me on Thursday. They had some freshwater experience with trout on Michigan rivers, so we focused on saltwater fly fishing techniques including line management, hook setting and playing fish. Keith McClintock, from Lake Forest, IL fished the backcountry of Gasparilla Sound near Boca Grande with me on Friday. With a big full moon and behind a front, fish weren’t too aggressive that day. However he had good action with some nice trout and also caught a red and snook on CAL jigs with shad tails to complete his slam. 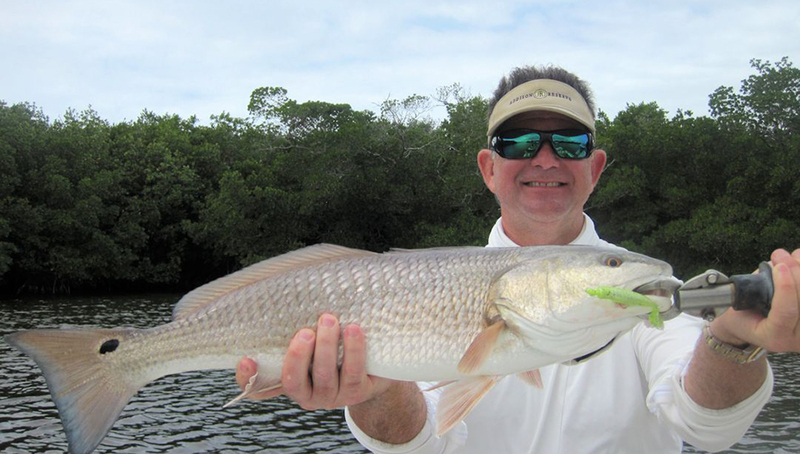 Larry Wachtel, from Boca Raton, FL, with a nice red caught and released on a CAL jig with a shad tail while fishing the backcountry of Gasparilla Sound near Boca Grande with Capt. Rick Grassett. Anglers fishing with me, out of CB’s Saltwater Outfitters on Siesta Key, had good action catching and releasing trout in Sarasota Bay on CAL jigs with shad tails and flies and reds, snook and trout on CAL jigs with shad tails in Gasparilla Sound near Boca Grande during the past week. With water temperatures in the 70’s, shallow water fishing is turning on. Sam Diviase, from Longboat Key and Mark Rinalli, from PA fished deep grass flats of Sarasota Bay with me on Monday and Tony Merlis, from NH, fished the same area with me on Tuesday. They had good action catching and releasing trout to 18” and more on CAL jigs with shad tails and Ultra Hair Clouser flies. Keith McClintock, from Lake Forest, IL and Ron Shay, from SC, fished the backcountry of Gasparilla Sound near Boca Grande with me on Wednesday. They had good action catching and releasing trout to 4-pounds, reds and snook on CAL jigs with shad tails. Larry Wachtel, from Boca Raton, FL and Stan Brady, from OH, fished the same area with me on Thursday. They also had some action catching and releasing trout to 21” and a nice red, also on CAL jigs with shad tails. I was the instructor for a full class at CB’s Saltwater Outfitters Orvis-Endorsed Fly Fishing School on Saturday. Students received fly casting instruction and also learned leader construction, fly selection and saltwater fly fishing techniques. The next school will be on March 24th. Contact CB’s Saltwater Outfitters at (941) 349-4400 or [email protected] to make reservations. There should be good action with trout, blues, Spanish mackerel, pompano and more on deep grass flats of Sarasota Bay. Fishing shallow water for big trout, snook and reds should also be a good option. Our natural resources are under constant pressure, please limit your kill, don’t kill your limit! Wow, so much for winter. Looks like the cold weather has come and gone with temperatures in the 80’s so far this month. Along with the warm weather the water temperatures have jumped right back up in to the low seventies. Clients are catching snook, redfish and lots of speckled trout as well as black drum, Spanish mackerel and ladyfish. Dean and Avia Friedman used live shrimp to catch several over slot speckled trout, ladyfish, sheephead and a couple of small snook. This week saw Tom Allen of Sarasota fishing with grandson George catch a bay slam while George came up just shy of his bay slam when his snook became a longline release. It was close. Remember, the best time to go fishing is when you can and be sure to save some for seed! Patrick Morrison, from MA, with a trout caught on a CAL jig with a shad tail while fishing deep grass flats of Sarasota Bay with Capt. Rick Grassett. Anglers fishing with me, out of CB’s Saltwater Outfitters on Siesta Key, had good action catching and releasing trout in Sarasota Bay on CAL jigs with shad tails and flies and snook and blues in the ICW at night on flies during the past week. The best action was with snook and blues in the ICW at night. Siesta Key and Longboat Key winter residents, Joe Brinkmeyer and Jim Brady, Phil and Brenda Rever, from MD and Bill Morrison, from Anna Maria Island and his grandson, Patrick Morrison, from MA, all fished deep grass flats of Sarasota Bay with me on several different trips. They had good action catching and releasing trout and more on CAL jigs with shad tails and flies. Jerry Poslusny, from Palmetto, and Rich Hunter, from Longboat Key, fished the ICW with me on Tuesday night. 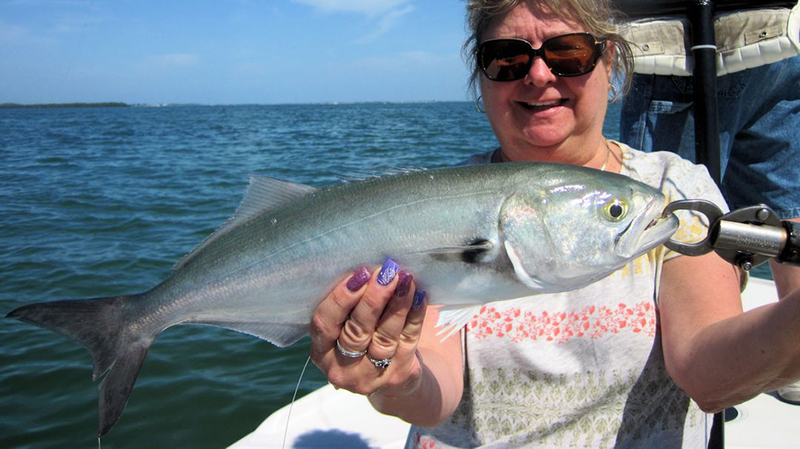 We had a blues invasion as hungry bluefish dominated some of the areas we fished. They caught and released about 20 fish on my Grassett Snook Minnow fly, half snook and half bluefish up to 4-lbs. It was not a problem, since the chunky blues fought as hard as or harder than many of the snook! Martin Marlowe, from NY, fished the ICW at night with me on Thursday. He also had great action with snook to 27” and blues to 4-lbs on the same fly. I saw something that night that I’ve never seen before in more than 30-years of fishing our waters, a 75-lb or larger Goliath grouper in a snook light along with many snook, blues and ladyfish. The big fish took a prominent ambush spot behind one of the outside pilings of a boat lift. Although we caught snook and blues out of the same dock light, the fish never tried to eat any of our hooked fish or our flies. The more time you spend on the water, the more likely you are to see strange things like this! I was one of the FFI (Fly Fishers International) casting instructors (CI), along with Master Casting Instructors (MCI) Capt. Pete Greenan and Capt. Rex Gudgel for Mangrove Coast Coast Fly Fishers annual fly casting clinic at The Meadows in Sarasota on Saturday. An enthusiastic group of fly anglers showed up for the event. Beginners received basic instruction while more experienced casters fine-tuned their casting. A great event by MCFF, free and open to the public! There is still time to sign up for CB’s Saltwater Outfitters Orvis-Endorsed Fly Fishing School next Saturday, Feb 24th. The course, designed for beginning and intermediate fly casters, will focus on basics but also work with intermediate casters on correcting faults and improving casting skills. Cost for the school, which will run from 8:30 AM to 2 PM, is $175 per person and includes the use of Orvis fly tackle and lunch. Contact CB’s Saltwater Outfitters at (941) 349-4400 or [email protected] to make reservations. There should be good action with trout, blues, Spanish mackerel, pompano and more on deep grass flats of Sarasota Bay. Fishing shallow water for big trout and reds should also be a good option. Our natural resources are under constant pressure, please limit your kill, don’t kill your limit! 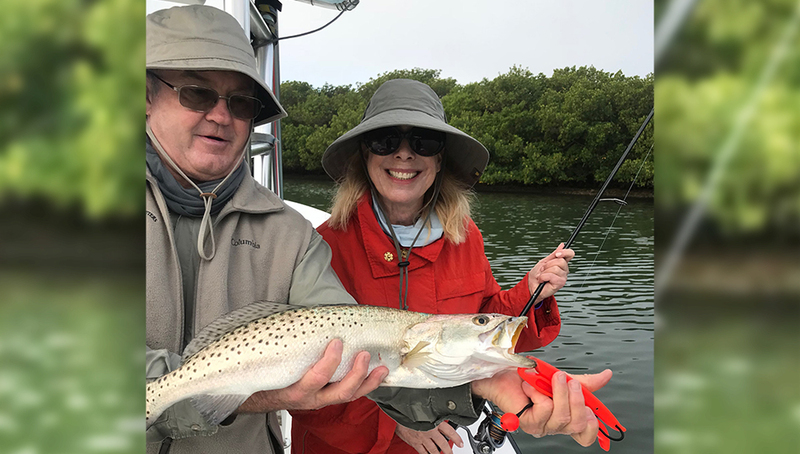 Farlow Blakeslee, SC, enjoyed a successful fly fishing outing with Capt, Ed Hurst out of C B’s Outfitters on Siesta Key. Farlow caught trout, Spanish mackerel, bluefish and ladyfish. Farlow was using an 8 wt Orvis Helios 2 rod with an Orvis Exciter clear sink tip line. Charturse and White Clouser deep minnow seemed to be the fly of choice. The water around the Middle Grounds was cloudy and full of snot grass. As we moved farther north the water cleared up and the fish became more cooperative. The water temperature was 72. All the fish were released. Anglers fishing aboard my boat the O’ Fish All out of CB’S Saltwater outfitters on Siesta Key caught and released pompano, Spanish mackerel, seatrout, bluefish and snook. With the weather warming up this week so did the fishing. We are catching good numbers of fish on DOA CAL Shad tails in 3 to 6ft of water. Fly fisherman are catching these same fish using sink-tip fly lines with weighted closers and deceivers. Tripletail is still a good play for anglers looking to sight cast to fish. Night snook fishing has also improved with the warmer conditions. Anglers fishing with me, out of CB’s Saltwater Outfitters on Siesta Key, had good action catching and releasing trout and Spanish mackerel in Sarasota Bay and tripletail in the coastal gulf on flies and reds and trout on CAL jigs with shad tails in the Terra Ceia area during the past week. The best action was with big trout in skinny water in Sarasota Bay, tripletail in the coastal gulf and reds in skinny water in the Terra Ceia area. Nick Reding, from Longboat Key and Mike Perez, from Sarasota, waded a couple of shallow flats in Sarasota Bay with me on Monday. The action wasn’t fast but they caught and released a few quality trout up to 22” on Grassett Flats Minnow and Clouser Minnow flies. Alan Sugar, from MI, fished deep grass flats of Sarasota Bay with me on Wednesday and had some action catching and releasing trout and a Spanish mackerel on Ultra Hair Clouser flies. A couple of classmates from MD and DE whom I hadn’t seen in more than 40-yrs, Jim Willey and Gary Zlock met me at the boat launch at the end of my trip on Weds to say hello. We took a short trip to bend the rod on a few trout and shared a beer and a burger at the end of the day. Great to catch up! Keith McClintock, from Lake Forest, IL and Jack McCulloch, from Lakewood Ranch, FL, fished the Terra Ceia Bay area with me on Tuesday. They had great action with several reds and trout on CAL jigs with shad tails. The most memorable trip of the week was with Martin Marlowe, from NY, on Thursday. We hunted tripletail in the coastal gulf, found several and he caught and released the personal best tripletail ever caught on my boat! The big fish ate a shrimp fly pattern on a 7-wt fly rod, ran deep into the backing and put on a show jumping. We survived getting wrapped on the crab trap line to bring the fish to the boat. Congratulations Martin! I was one of the seminar speakers at the 2018 Florida Fly Fishing Expo at the Plantation resort in Crystal River, FL on Friday, 2/9. The Fly Fishers International (FFI) event featured some of the best fly tiers and fly fishing anglers and guides in the state, including legendary Florida Keys fly fishing guide, Steve Huff. The show featured seminars, fly tying and fly casting clinics and demonstrations. I gave a presentation to an enthusiastic, standing room only group on fly fishing for snook at night and deep grass flats of Sarasota Bay. Fish the windows of stable weather between fronts for the best action. Sunny afternoons and evenings with some protection from the wind should fish better this time of year due to warmer water. 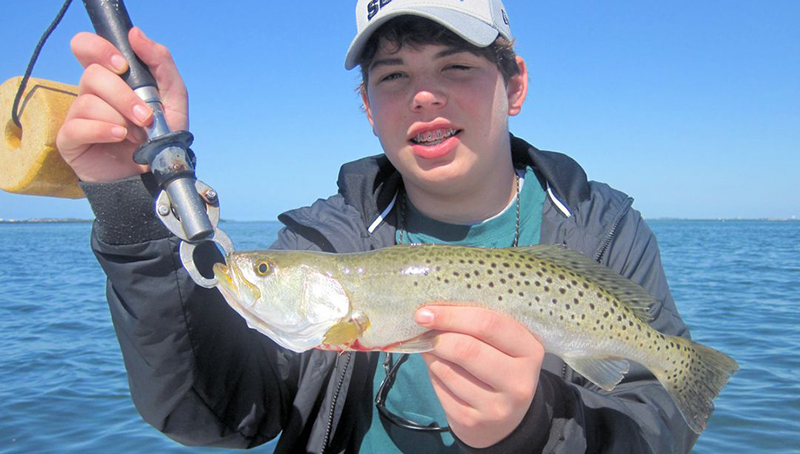 There should be good action with trout, blues, Spanish mackerel, pompano and more on deep grass flats of Sarasota Bay. Fishing shallow water for big trout should also be a good option. I think it is appropriate to discuss something here that has been bothering me for a while. Not that there’s anything wrong with catching and eating fish, but I think boat limits are needed for both guides and recreational anglers. With numerous species of fish available to catch and bag limits as they currently are for some species, it may be legally possible to keep a total of 30 to 40 or more fish depending on the species and number of anglers on a boat. I don’t think Sarasota Bay and surrounding waters can support that kind of pressure. Some people forget or never knew about the conservation battles that many guides, along with CCA, fought in the past with redfish in the 80’s, the gill net ban in the 90’s, snook regulations and more to get to where we are today. With an increasing population and more anglers fishing, less habitat due to development and declining water quality due to residential runoff and agricultural pollution, fishing is bound to decline if we don’t all do something about it. Just my opinion, but as a guide for 28-years I promote catch and release fishing and conservation to all of my clients and I think it is important to set that example. I’m not trying to be judgmental, but just because we can legally kill a limit of fish doesn’t mean we have to, to be successful. Everyone is the captain of their own vessel and can set lower limits themselves. Guides are teachers, we can make a difference or have a negative impact. As I say every month in my fishing forecast, please limit your kill, don’t kill your limit! With water temperatures in the low to mid 60’s, we are in a winter fishing pattern now. Deep grass flats of Sarasota Bay have been producing the best action and variety. Anglers fishing with me, out of CB’s Saltwater Outfitters on Siesta Key, had good action catching and releasing trout on flies, CAL jigs with shad tails and DOA Deadly Combos during the past week. 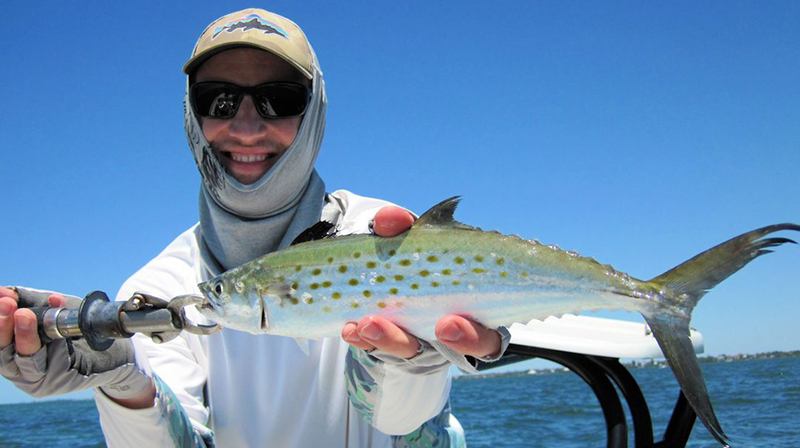 In addition, fly anglers also caught and released several blues and Spanish mackerel. John, from Longboat Key, and Drew fished Sarasota Bay with me on Tuesday and Thursday. They had good action catching and releasing numerous trout to 18” on CAL jigs with shad tails and DOA Deadly Combos. Fly anglers, Jerry and Peggy Brenner from NH, fished deep grass flats of Sarasota Bay with me on Wednesday. They had some action catching and releasing trout, bluefish and a Spanish mackerel on Ultra Hair Clouser flies fished on sink tip fly lines. Holmes Beach and Sarasota winter residents, Bill Morrison and Gary Marple, also had some fly fishing action with trout in Sarasota Bay with me on Friday. 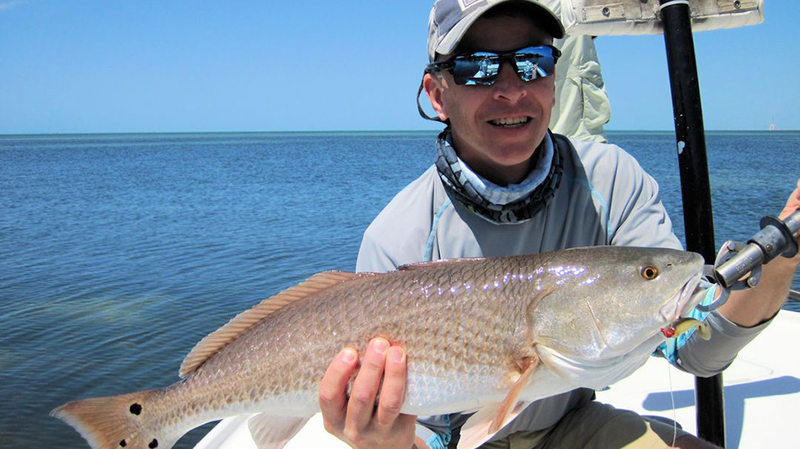 There should be good action with trout, blues and more on deep grass flats of Sarasota Bay. Shallow water action for larger trout and reds should be improving due to cooler water. Fishing lighted docks and bridges in the ICW for catch and release snook with flies and DOA Lures should also be a good option. Enjoy FULL day boat rentals for 1/2 day rates now until Dec. 15. Call 941-349-4400 to reserve. Outfitters is open at 7 a.m.
CB’s Saltwater Outfitters, 1249 Stickney Point Rd, Sarasota, FL have announced dates for their Orvis-Endorsed fly fishing schools for the winter and spring; Jan 20, Feb. 24, Mar. 24, and Apr 14, 2018. Located on Siesta Key, named Best Beach in America, the schools will cover fly casting basics, line control, shooting line and the roll cast. Instructors, Capt. Rick Grassett and Capt. Ed Hurst, will also cover leader construction, fly selection and saltwater fly fishing techniques. The course, designed for beginning and intermediate fly casters, will focus on basics but also work with intermediate casters on correcting faults and improving casting skills. Cost for the schools, which will run from 8:30 AM to 2 PM, is $175 per person and includes the use of Orvis fly tackle and lunch. Contact CB’s Saltwater Outfitters at (941) 349-4400 or [email protected] to make reservations.